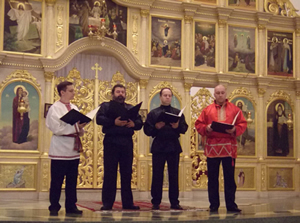 On Tuesday, May 4th, 2010, Detroit was treated to a spectacular and inspiring concert performance by the world-renown male vocal ensemble, the Konevets Quartet of St. Petersburg, Russia, which held the audience spell-bound. 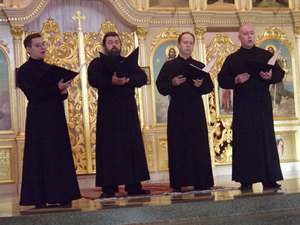 Their magnificent choral performance of Orthodox sacred and folk music was held in the St. Lazarus Serbian Cathedral on Van Dyke and Outer Dr. in Detroit, where the superb acoustics enhanced the exquisite ethereal experience. They performed a varied program of pieces of different ethnic traditions from the 10th to the 20th century. Their four voices were as strong as a choir of 40, and resonated in every inch of space in the large cathedral. The audience was most responsive and appreciative of the incredibly uplifting experience. 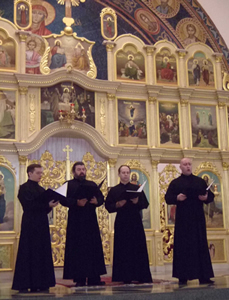 The Quartet has recorded numerous CD’s, which were available for purchase after the concert. 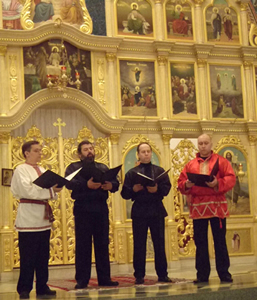 Undoubtedly the singing of these four singers inspired and uplifted all who were present, especially Orthodox church choir singers and chanters, and demonstrated an ideal towards which all Orthodox choirs might aspire. Singing with profound depth of spiritual feeling, in perfect balance and harmony, fully attuned to each other, with an awesome range of dynamics, they evoked the profound spiritual beauty that ought always to characterize the beauty of Orthodox divine worship continuously offered before God’s throne, in which we on earth are allowed to participate with the angels and saints in heaven. A delicious reception was held in the church hall after the performance, prepared and hosted by the church’s Ravanica Serbian Choir. All those present, who shared in this incredible transcendent experience, are thankful to the Council of Orthodox Christian Churches (COCC) of Metro-Detroit, and to the co-sponsorship by the Serbian Ravanica Choir of St. Lazarus Serbian Cathedral, who graciously hosted the concert and reception, and to the St. John Chrysostom Clergy Brotherhood of Metro-Detroit, which was instrumental in bringing the Konevets Quartet to Detroit for this stellar performance. Here are six photos of the concert. 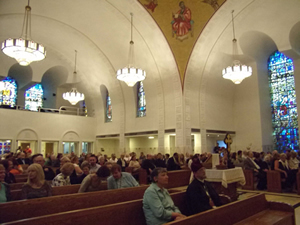 Photos 1 & 2: During the sacred music part of the concert. 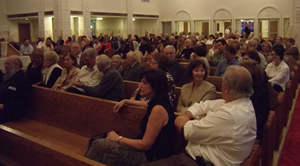 Photos 3 & 4: Approximately 200 people attended the concert in the large cathedral, as seen during the intermission. Fr. Roman Star & Matushka Rose Marie are visible in the front row in the photo on the left. During the folk music part of the concert.